Have you ever wondered to yourself “just what have the Scandinavians ever done for us?” Aside from ABBA, carbonated water, nordic skiing, Vikings, reaching the South Pole first, Lego, Sven Goran Eriksson and Volvo, that is? One thing that will more than likely top of most peoples’ lists when it comes to Scandinavian achievements (apologies to Roald Amundsen!) is the Scandinavian style of home furnishings. Gritty dramas such as Wallander, Beck and The Bridge have, in recent times, thrust Scandinavian culture and all its stylish interiors firmly into the limelight. A big influence on the Scandi style is, of course, the typically cold Scandinavian climate, which means there really isn’t a lot to go outside for in those long, cold winter months. Which is why home interiors come more sharply into focus in this part of the world. Another word you might have heard in connection with Scandinavian style is “hygge”. “Hygge” is a more of a notion than a style and comes from a Danish word that has no actual translation in our own mother tongue, although it is in fact related to the English word “hug”, which helps you to begin understanding its meaning. Helen Russell, author of The Year of Living Danishly, summarises it as “complete absence of anything annoying or emotionally overwhelming”. Minimalist design, wood elements and a place to entertain – I’m starting to feel all “hygge” inside! To get to the essence of hygge, you need to place yourself at home in the depths of a sub arctic winter, sat in front of a blazing fire with your feet up, wearing a comfy set of PJs and sipping on a large mug of hot chocolate and marshmallows. In essence, it’s all about that feeling of warmth and wellbeing, which can only be achieved when you are happy and comfortable in your own surroundings. So what typifies a Scandinavian style kitchen? 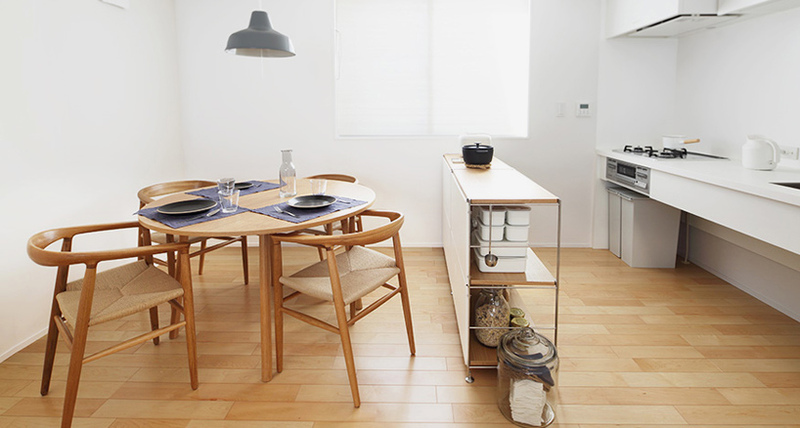 Well, much like many popular, contemporary styles, the Scandi style is fairly minimalist in its approach. There are no great embellishments, no overbearing patterns, with the emphasis on a pared back look. The Scandinavian style promotes the use of natural materials, with wood in various colours and finishes a recurring theme, especially when it comes to kitchen worktops. Everyday functionality is treated with great care and furnishings tend to have more attention lavished on them, with simple yet well-made furniture and textiles enhancing the style. One key element of the Scandinavian style kitchen is the ability to come together as family or friends and enjoy time spent in each other’s company. A kitchen for entertaining is worth investing in, in terms of money and space, so why not add a table to gather round or a central island for preparing meals? Kitchen lighting is another key consideration (in a part of the world where daylight is at a premium, it’s hardly surprising). Candles are a quick and easy way to add a bit of “hygge” style warmth to your kitchen, but if you’re a little worried about fire safety, innovations such as portable LED lamps are quickly gaining popularity. The emphasis of your Scandinavian style kitchen should be firmly focused on the more functional aspects. Keep your colour scheme nice and simple, with white units or cabinets, but add more natural elements in the form of real wood worktops or, if price is a concern, a laminate kitchen worktop with a wood effect finish. No matter which type of finish you choose, try to add in other natural yet unfussy elements to your room, such as a stone or stone effect floor, cork or even marble. So, in the words of another great Scandinavian export, why not “take a chance” on a Scandinavian kitchen? You certainly don’t need “money, money, money” to achieve this style!